Mix and enjoy! And do not forget to check out Pearlspotting on Facebook, too. This entry was posted in Uncategorized and tagged design & decoration, food, gluten-free, Paris, recipe on May 20, 2014 by Miia. 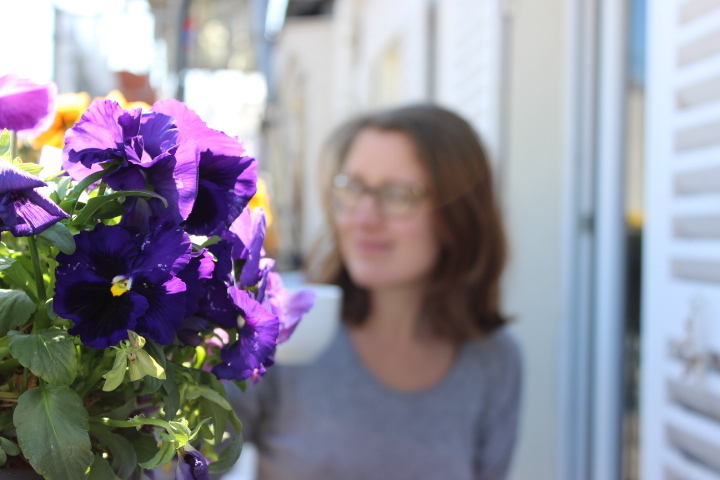 The first coffee of this spring enjoyed on the balcony. Need to turn this into a habit! Note: Due to a problem on WordPress, you probably missed the last post Perfect Weather for Hamburgers. 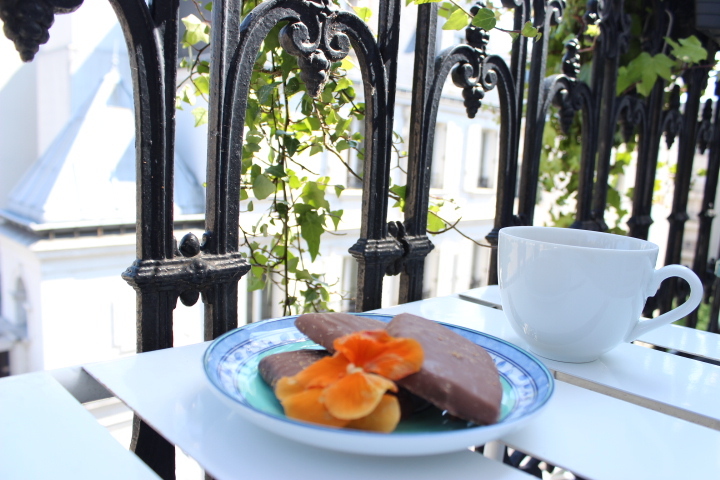 This entry was posted in Uncategorized and tagged architecture, design & decoration, food, France, gluten-free, Paris, recipe on May 17, 2014 by Miia. 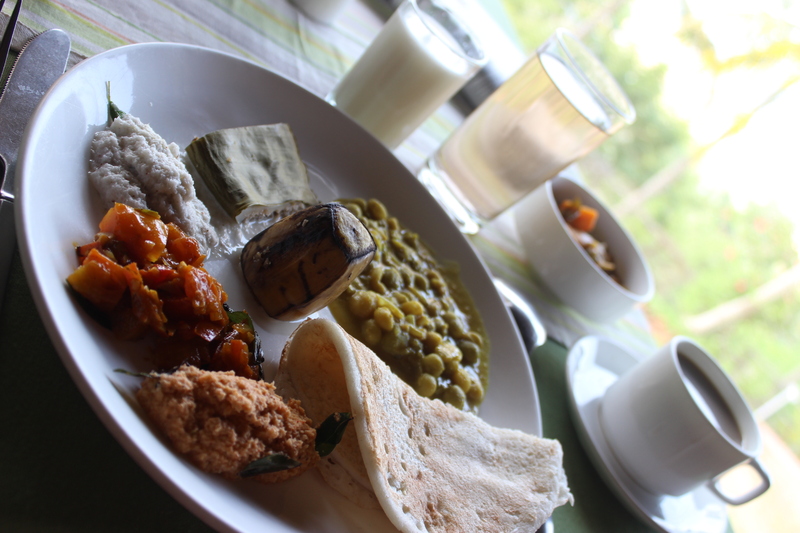 I have never seen a country where a simple breakfast varies as much as it does in India. Generally speaking North Indian breakfast that tourists most commonly come across with is about masala omelette or puri (bread made of wheat) served with curry stew, whereas South Indian breakfast is more about eating things cooked with rice flower and coconut. I have now had two breakfasts at Somatheeram Ayurveda Resort and it has been a great pleasure to sample typical Kerala delicacies while watching the enormous Indian Ocean in front of me. Yesterday I had herbal tea, banana lassi and coffee as drinks. To eat I had curry leaf idly (the round thing in the photo) with sambar, rice puttu (rice flour dough layered with grated coconut) with kadala curry and sweet rice ada (Kerala delicacy cooked in banana leaf). This morning there were some variations so I had green pea curry, tattu dosa (again, made of rice flour) with sambar and chutneys, and steamed banana. Rice ada was the same as yesterday. I am neither a big wheat eater nor a great fan of eggs, so I am very happy eating idlies and dosas for breakfast. In fact I like South Indian breakfast so much that I could eat them for breakfast even in Paris –all I would need is a live in South Indian cook! Note: As Somatheeram Ayurveda Resort welcomes guests that are serious about feeling better by eating well and by following special treatments, there are specific diets available for all sorts of people and illnesses. For example, when I told my Ayurveda doctor during the initial consultation that I don’t stand wheat and eggs very well he directed me towards a gluten-free diet (he printed out a list of items that are good for me to eat!). This entry was posted in Uncategorized and tagged food, gluten-free, hotel, India, Kerala, North India, restaurant, South India on April 20, 2014 by Miia. Fish eggs for breakfast anyone? I live in Paris where bakeries are full of richly buttered croissants, but to be brutally honest, I eat a croissant approximately once a year! Shocking, isn’t it. Originally, I come from Finland, which is a country of savory breakfasts, but I don’t eat typical Finnish breakfast (porridge) either. So, what is it, what do I eat? Well, I often have rice cakes with salmon and avocados. Or avocados and cheese. Sometimes I add turkey. Or if I made Indian food the night before, I would eat leftover dal for breakfast. 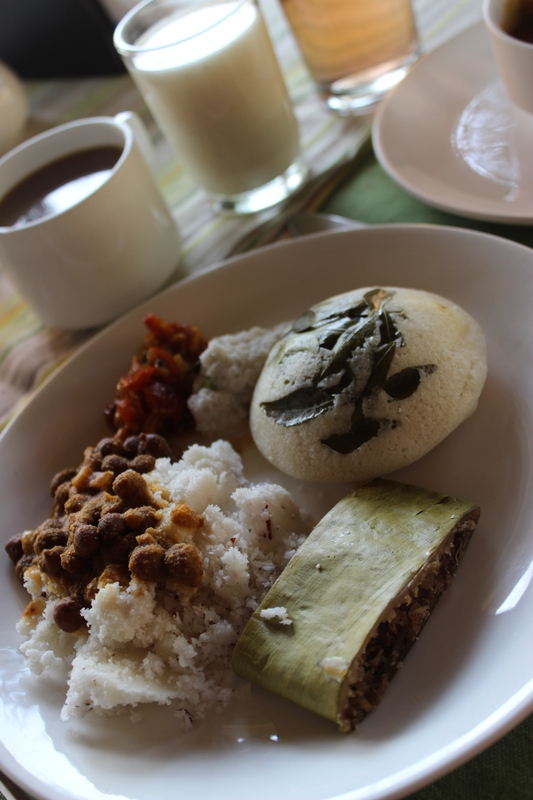 To be honest, my ultimate happiness was found in South India where I could eat idli and sambar for breakfast! Yummy. I do admit, I have weird breakfast habits but I am afraid they are now getting even more strange (some of you may call them disgusting). 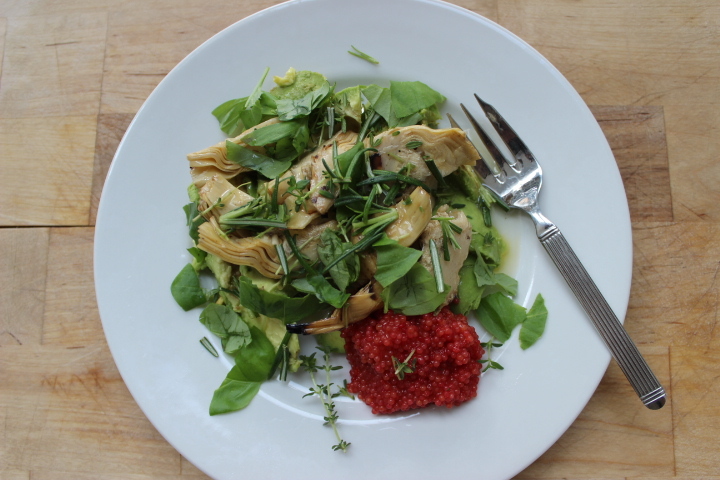 For some time now, I have been preparing a salad that consists of fish eggs, grilled artichokes, avocados, truffle oil and fresh herbs (thyme, basil and rosemary). The fish eggs I have been buying are some of the cheapest available in Paris (and apparently the saltiest) and of course it would be better to buy salmon eggs but they are considerably more expensive. 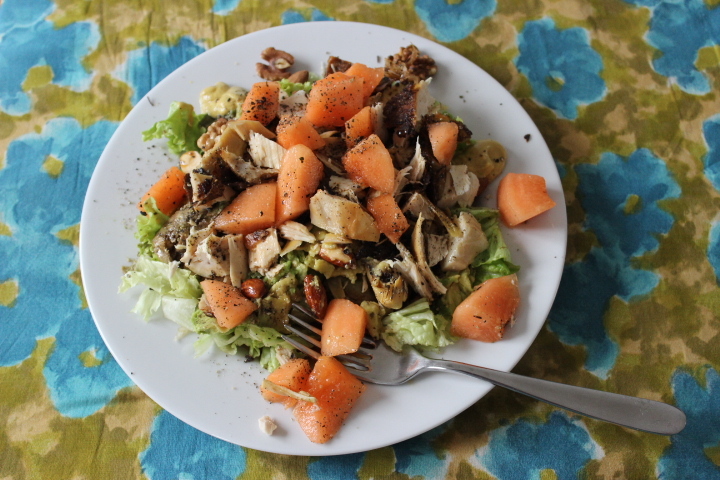 Anyhow, apart from these “cheap” eggs, everything in this salad is very good for your health. Most importantly, I love the combination, which fills the stomach, but not the same way wheat does (yes, I try to avoid gluten as often as I can). Would you eat this salad for breakfast? Do you have a breakfast recipe you like making but think it is utterly crazy? Let me know (and make me feel less weird..)! This entry was posted in Uncategorized and tagged food, France, gluten-free, Paris, recipe on March 25, 2014 by Miia. Doing groceries at the food market is exciting: you never know what you come home with! The weekly market supply for food products depends on the season, on the weather, on transport issues, on regulations, on trends, on political issues, etc. –you name it! And that is why it is so interesting (if you like unpredictability). For example today, my husband asked for the price of mussels. The seller was in a hurry to return home and responded: “They were caught yesterday. I have tried to sell them for 6€ and nobody wants them, so if you like, take them home for free”. My husband offered him money anyway but the seller smiled and said no worries. So, today’s (late) lunch is going to be mussels with parsley, celery, onions, white wine (Muscadet) and crème fraiche. 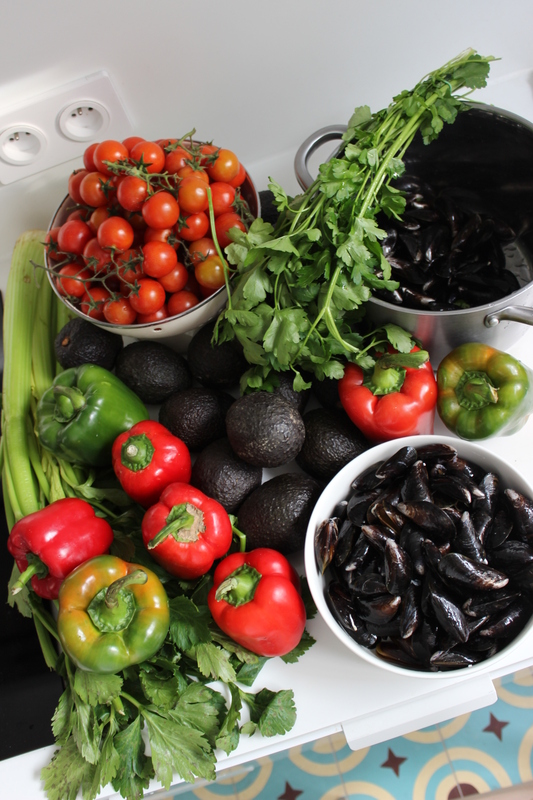 And guacamole, grilled bell peppers, slow-roasted cherry tomatoes for the rest of the week. La vie est belle! PS If you like this, why not to join Pearlspotting on Facebook? This entry was posted in Uncategorized and tagged food, France, gluten-free, market, Paris, recipe, wine on March 2, 2014 by Miia. Le Tipaza is located in the northern part of the 15th arrondissement, not far away from the Eiffel Tour and UNESCO. 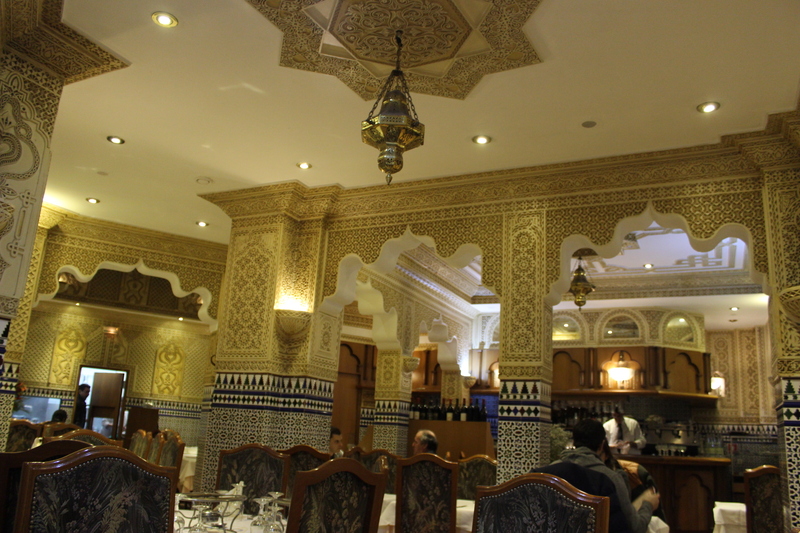 We used to go this Moorish restaurant a lot in the past and were always very pleased with food and service. And yesterday was not an exception! 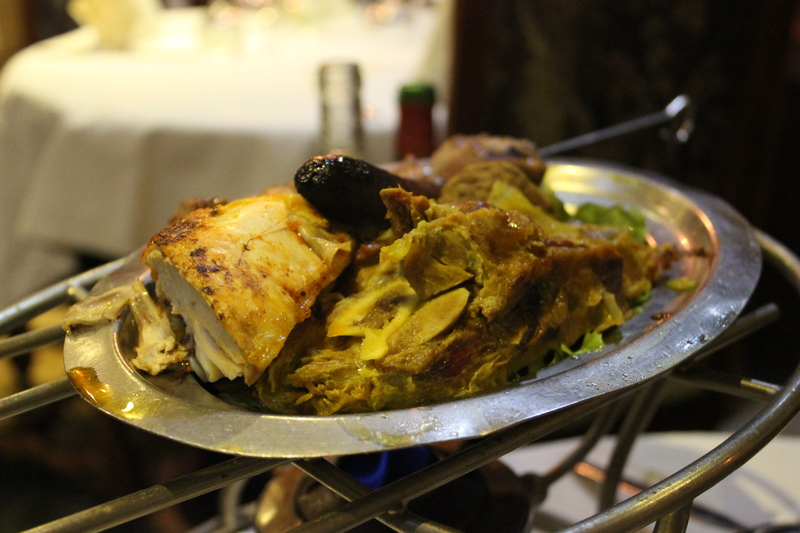 Le Tipaza serves classic North African specialties (couscous and tajine) and some French dishes. My husband always chooses couscous and I take tajine (which is gluten free because it comes without the semolina). The wines come from Algeria, Morocco and France. My husband’s couscous royal came with a large bowl of hearty vegetable stew, a plate of mixed grilled meats, small bowls of raisin and chic peas, and semolina of course. He absolutely loved the stew, beef and chicken. The rest (merquez and lamb) he found tasty, too, but a bit dry. Anyhow, it was an excellent couscous. I usually have tajine with lamb but changed my mind and ordered chicken. 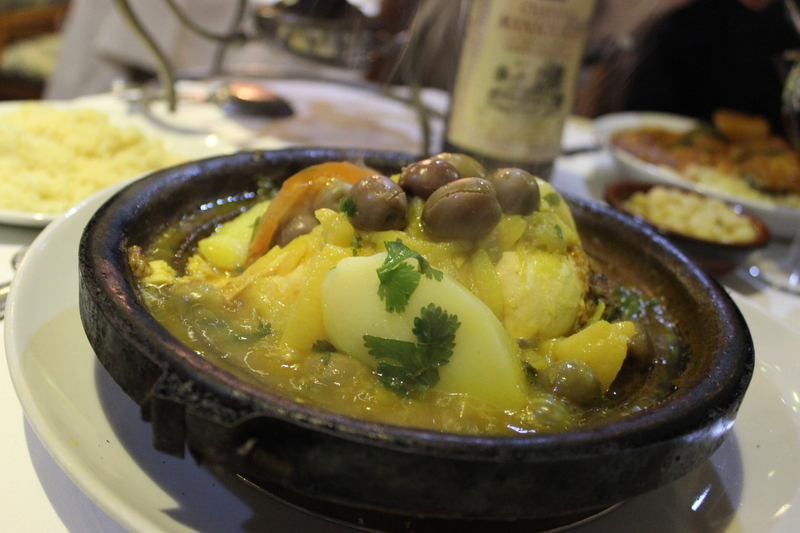 The tajine I chose came with preserved lemons, onions and olives. Some potatoes were included in the dish, too. It was delicious!! Such a delight! We drunk Château Mansourah, Côteaux de Tlemcen (Algeria) and it was a perfect choice: aromatic, slightly maderized red wine made of grapes that grew under that strong African sun. On previous occasions when drinking North African wines we have noticed that they make us really tired –maybe it is the sun effect? Yesterday again we felt the same and in the end of the meal we could have fallen asleep right way. The dinner was very enjoyable and we were happy customers, but indeed the only thing we could have wanted more was a magic carpet to fly us home over Paris! 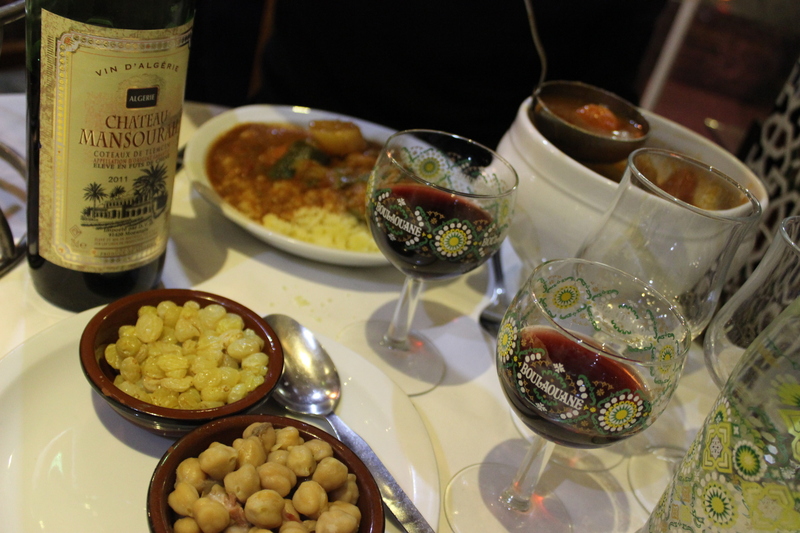 Lastly, the bill was 51€ for a couscous, a tajine and a bottle of wine. Excellent price-quality ratio! Le Tipaza: 150 Avenue Emile Zola, 75015 Paris. Tel: 01 45 79 22 25. Metro: Avenue Emile Zola. This entry was posted in Uncategorized and tagged Algeria, architecture, design & decoration, food, France, gluten-free, Maghreb, Morocco, Paris, restaurant, wine on March 1, 2014 by Miia. 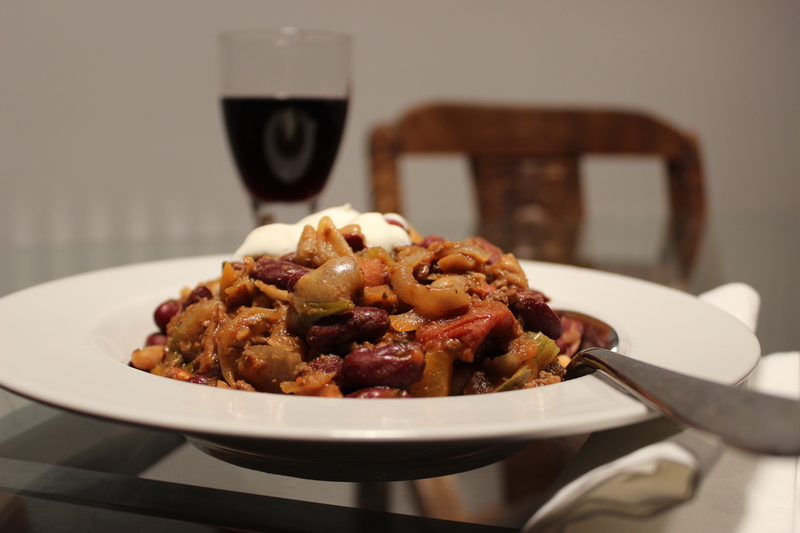 “If It’s Chili, It’s Personal” runs the title of a recent article by The New York Times. And this is exactly what I was thinking last Thursday when I was home alone, preparing Chili con carne at 10 pm. Make it personal, use your imagination. 1. Saute two large sliced onions until they get nice brown color. Add garlic, cumin-coriander powder, Indian chili powder, lots of dried marjoram, paprika powder and Jamaica pepper (also called “allspice”). Add minced beef meat (about 600g). Keep stirring. 2. Add slices of raw carrot (I used two medium-size carrots). 3. Add slices of celery (I used an entire celery stalk, about 20cm, not forgetting the leaves). 4. Add 2dl of tomato purée. 5. Add about 2dl of Slow-roasted cherry tomatoes. 6. Add two large cans of red beans and one can of white beans. 7. If you are in a hurry, the meal is ready. If you can wait, let it simmer for 30 more minutes. Add salt to your taste, if necessary. 8. I added one glass of Cahors red wine in the end. Lastly, serve hot with crème fraîche. 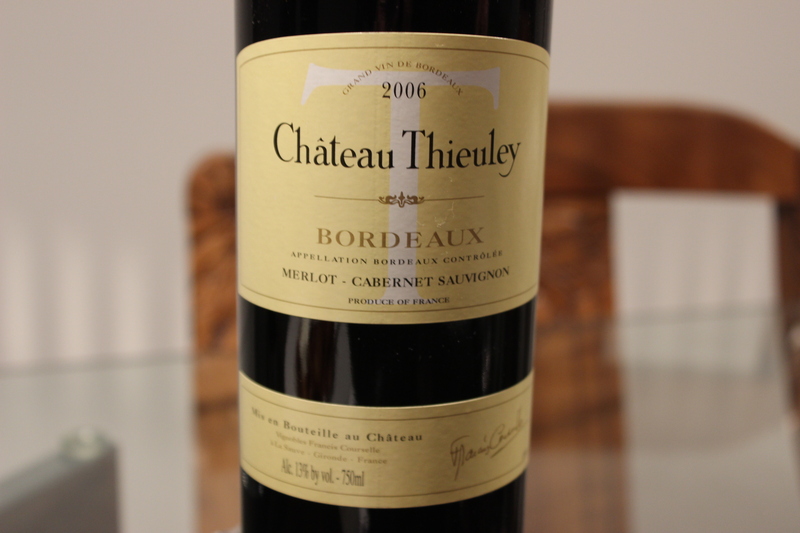 And as a meal like this would not be complete without a glass of wine, I had some very lovely red Bordeaux 2006 from Château Thieuley. Recommended in the 10€+ category! This entry was posted in Uncategorized and tagged Aquitaine, food, gluten-free, Paris, recipe, wine on February 17, 2014 by Miia.